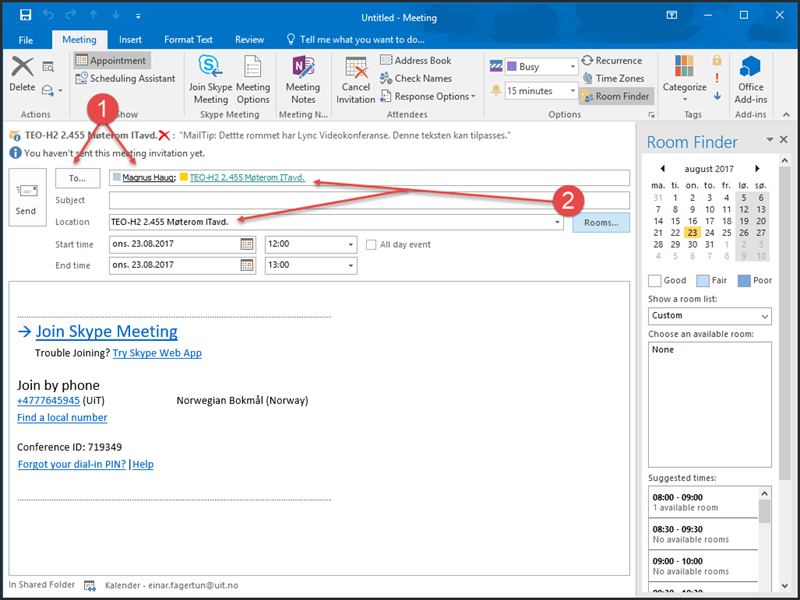 Schedule your meetings through Outlook. This user guide shows you how. Please note that the guide is for Outlook 2016. 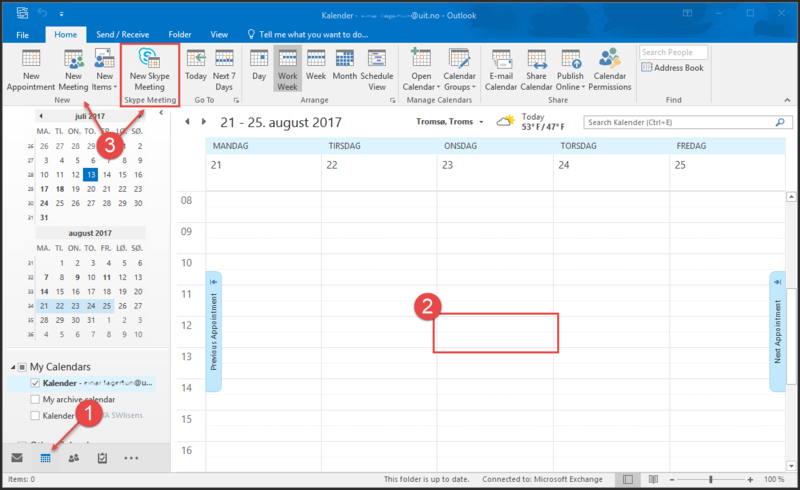 Access the calendar  in Outlook, and find a date for your meeting room reservation . Click "New Meeting" or "New Skype Meeting" . Note: If you selected "Skype Meeting" but still intend to reserve a room, delete the words "Skype Meeting" from the location field. The room will then be automatically added to the subject field. 1. Choose attendees. Either enter email addresses, or click the "To" buttom to access UiT's address book. 2. Select a meeting room from the list by clicking the "Rooms" button. Fill in the subject field, set a start and end time, enter any other text you may wish to add in the main field, and then click "send" to send the meeting invitation. If your meeting includes a room, you will receive an automatic email informing you of whether or not your room reservation has been accepted. When you are trying to plan a meeting, you may wish to know if the attendees are free in the relevant time period, or whether the room you plan to use is free for use. 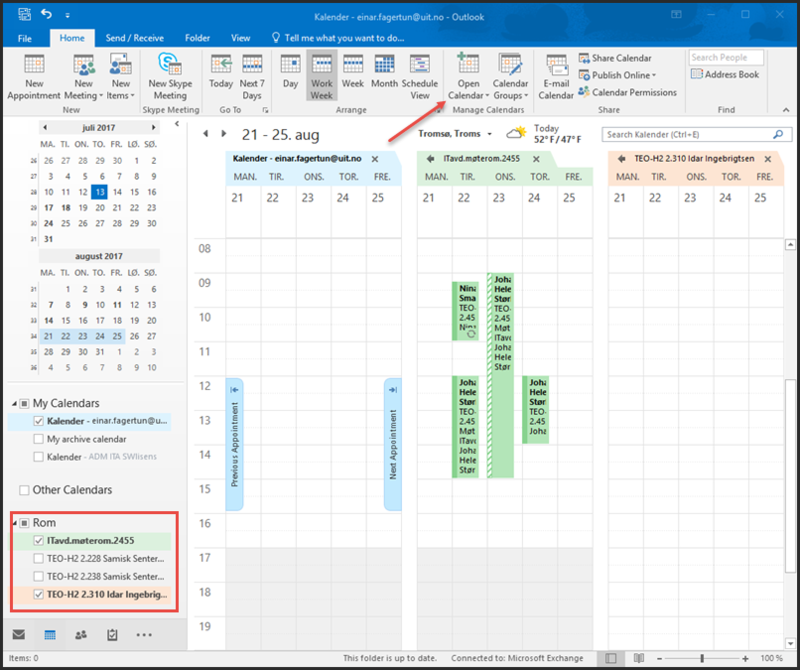 Outlook 2016 features a Scheduling Assistant for this use. 2. Add attendees and a room. Attendees can also be added manually by entering their email address under "All Attendees"
3. Select a timeframe that works for all attendees. If the room you have selected is not available in the timeframe that suits the attendees best, choose a different room. 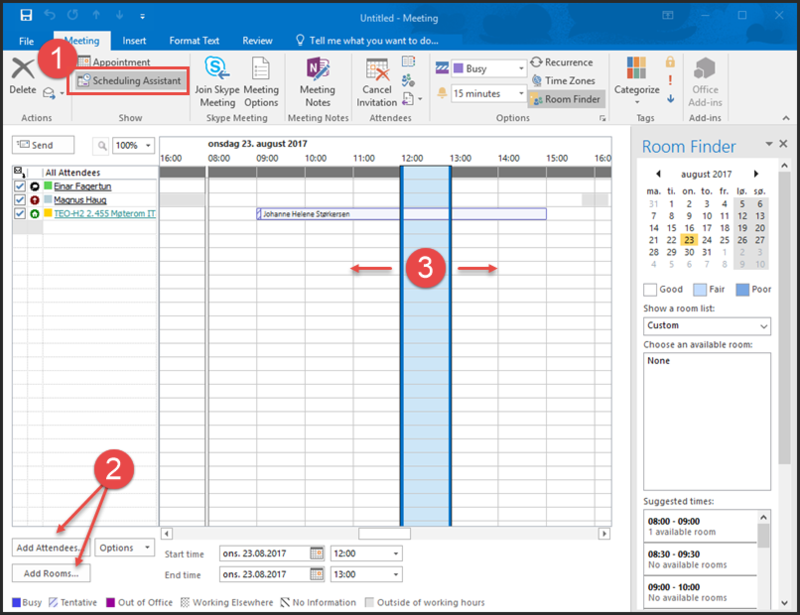 If you employ certain rooms on a regular basis, you can add them to your Outlook Calendar. This gives you a quick overview of your most commonly used rooms and their availability. From your calendar view, select "Open Calendar", then select "From room list". Select the rooms you wish to add and click "OK". You are now able to see the rooms' calendars side by side for an overview of their availability. Note: Always have your own calendar visible next to the room calendars, as you register room reservations in your own calendar, not the room calendars. If your room booking fails, the email will include an explanation. Someting has failed. Please send an email to orakel@uit.no, including the room you attempted to book, as well as the time period you tried to book this room for.